Guittone d’Arezzo (ca. 1230-1294) was the most important, prolific, and influential poet and prose writer of the thirteenth century. Unfortunately, his work has been overshadowed by his successor; the more learned and gifted Dante Alighieri. The poems and prose included in this volume are emblematic of the two phases of Guittone’s career: he first achieved fame as a secular love poet but following his conversion in the 1260s he became a renowned religious poet. Guittone’s artistic reputation commanded the highest respect. Even Dante’s beloved Guinizzelli and Cavalcanti never enjoyed any such fame in their lifetime. Antonello Borra presents a critical introduction to Guittone’s works with a selection of his poems and letters in facing-page Italian and English translation. 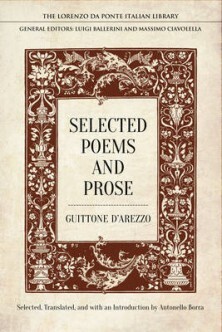 While Dante repeatedly condemned Guittone, recent scholarship has re-evaluated his importance and placed his work in the context of his predecessors, the Provençal troubadours and the poets of the Sicilian school. This latest volume in the Lorenzo Da Ponte Italian Library contains the first significant edition of Guittone’s works available in English translation.